That 4% market correction in July was quick and virtually painless. Not missing a beat after the market briefly tested 1900 then, the dip buyers came roaring back — gunning for the 2000 marker on the S&P 500, confident that longs were not selling and that shorts had long ago been obliterated. Needless to say, bubblevision had its banners ready to crawl triumphantly across the screen. When the algos finally did print the magic 2000 number, it represented a 200% gain from the March 2009 lows. And to complete the symmetry, the S&P 500 thereby clocked in at exactly 20 times the last twelve months’ reported earnings based on consistent historical pension accounting. The bulls said not to worry because the market is still “cheap” — like it always is, until it isn’t. Yet now more than ever is the time to keep the champagne corked. 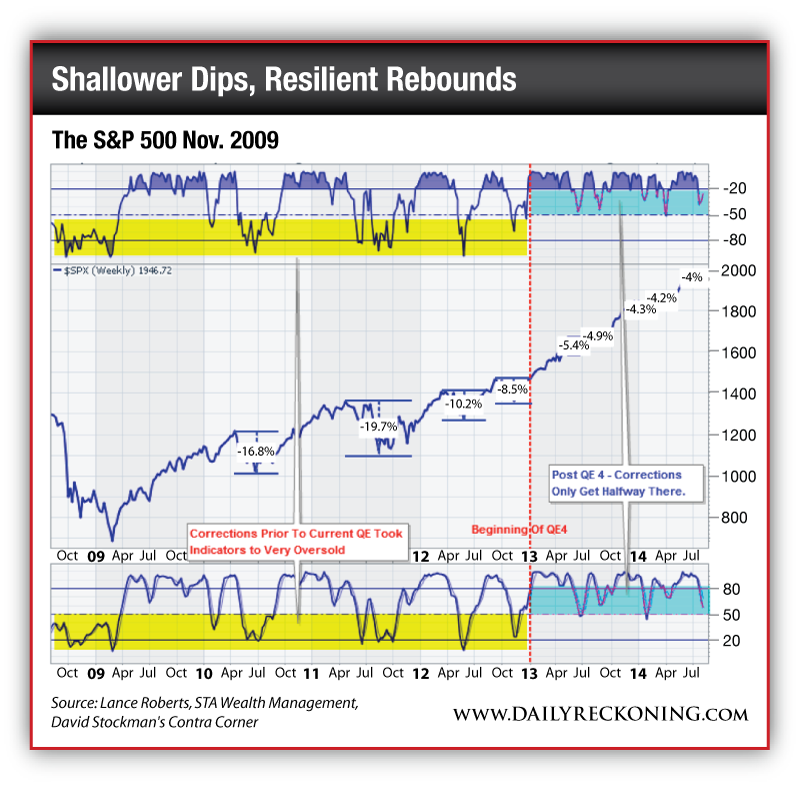 The stock charts show an outsized skunk in the woodpile, while the economic data completely belie the sizzling gains in risk asset prices that have been racked up during the last 65 months. Even more crucially, the Wall Street casino’s puppeteers at the Fed more or less admitted at Jackson Hole that they are utterly lost in Keynesian voodoo. To put it generously, Yellen’s speech amounted to a vaporous word cloud wrapped in incoherent double-talk. In this context, Lance Roberts, of STA Wealth Management, recently published a stock chart that shows why “S&P 2000” is yet another signal that a giant financial train wreck is waiting to happen. For a fleeting moment six years ago, the thundering 50% plunge of the stock indices caused a crisis of confidence in the Wall Street casino that had been fostered over two decades by Greenspan and Bernanke. During that short season of trauma and disbelief, the idea briefly resonated that prosperity cannot be built on towering mountains of debt and egregious stimulation and manipulation of financial markets by the central bank. But then began the greatest flood of monetary expansion ever conceived, with Professor Ben Bernanke leading the charge. So doing, he claimed to be combating a Great Depression 2.0 that never threatened based on Milton Friedman’s complaint about the alleged Fed mistakes of 1930-1933 that never happened. I documented these immense urban legends in my book, The Great Deformation. Suffice it to say that the thousands of mainly country banks which closed in the early 1930s were actually insolvent, not victims of Fed inattention; and that the short, sharp recession of 2008-09 involved the unavoidable liquidation of housing bubble inventory and jobs, not the onset of a depressionary plunge into an economic black hole. Nevertheless, Bernanke doubled the Fed’s balance sheet from $850 billion (built-up over 94 years) to $1.8 trillion during the seven weeks after the Lehman event; and then by the thirteen week mark in early December 2008 he had nearly tripled it to the $2.3 trillion. Moreover, once the genie of rampant money printing was out of the bottle, it did not take long to invent the pretexts for quantitative easing in its quick succession of phases and details. In a historical heartbeat, the balance sheet of the Fed soared to $4.5 trillion, eviscerating the last remnants of honest price discovery on Wall Street as it rambled upward. Just consider the most recent economic data. Even before the inevitable markdown of second quarter GDP in the next revision, real final sales posted at just a tepid 2% gain versus prior year. That was exactly the same as the 2% year over year real final sales gain posted in the second quarter of 2013, and down slightly from the 2.2% year over year gain recorded in Q2 2012. 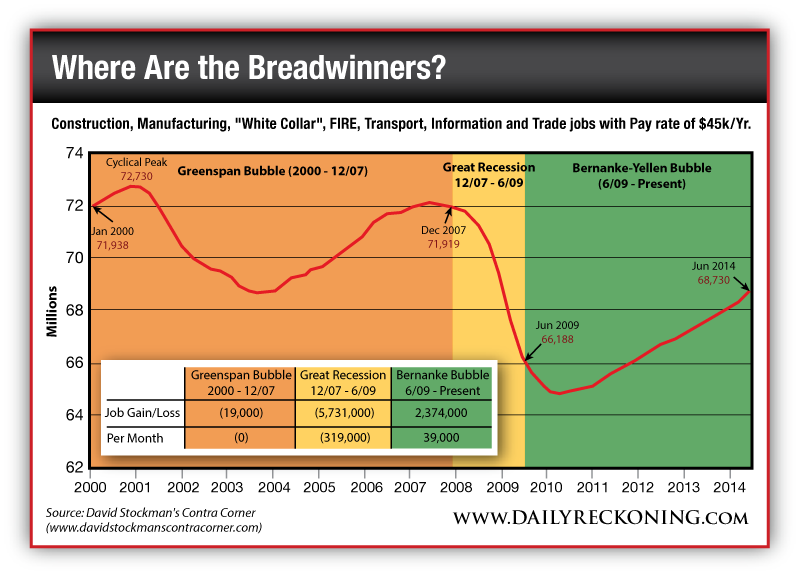 Altogether, the real economy has been stuck dead center in the 2% zone since the Great Recession officially bottomed in June 2009. Setting aside the footballing of quarterly inventory figures, in fact, real final sales have grown at just 1.7% per annum during the last 60 months. Needless to say, there is nothing remotely that weak in modern financial history. 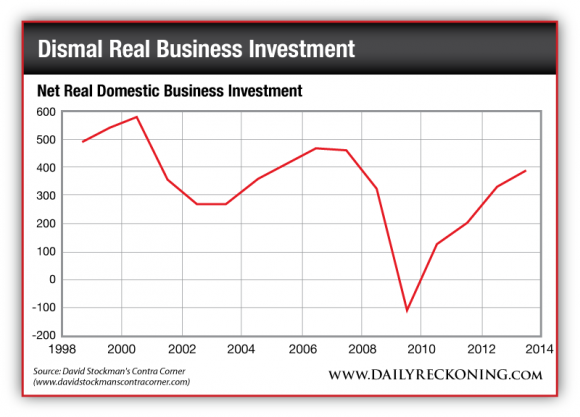 What has taken the stock market up is relentless multiple expansion and a dangerous over-valuation of corporate profits. The latter represents an economic aberration which has been achieved due to central bank policies that have made debt artificially cheap and labor inordinately expensive. An economy that is not creating breadwinner jobs, gains in real household incomes and real increases in productive assets is not remotely worth 20 times earnings. It is only a matter of time before another black swan event like the Lehman bankruptcy shatters confidence in the Fed’s con game, causing the pleasant undulations in Lance Roberts’ chart above to give way to another dizzying plunge. To be sure, the Fed is a serial bubble machine. But even it cannot defy economic gravity indefinitely.